Where does the time go? We’re already in the middle of winter, with a tiny bit more sunlight every day, and the assurance that we’ll again see the fresh green of tundra plants in less than five and a half months. In the meantime, we thank you for keeping the KNOM signal bright during the winter’s darkness. God bless you! INSPIRATIONAL SPOT: I would rather walk with God in the dark than go alone in the light. (left) Business manager Florence Busch, at left and volunteer Connie Fessell return from the post office the week before Christmas, just as a two-day blizzard began to rake the area. By the time the storm passed, snow had drifted as high as ten feet in places. Still, it was a relief from the 30-degree cold of mid-December! top YOWCH! According to the most recent survey by the University of Alaska, the cost of food in Nome is 174.2% what it is in Anchorage. Electric power is about double. Water and sewer are 845% more expensive in Nome, and despite all the talk about low fuel prices, gasoline is still about $2.00 a gallon. The higher costs are due to the expenses of barge and air freight, as Nome is not connected to the outside world by road. Many of KNOM’s benefactors have written this past month, requesting prayers for family and loved ones who have recently died, or who are experiencing special difficulties in their lives right now. Please join us in prayer for these wonderful people who, with you, make our mission possible. “AUDIO-FILE” (left) Florence Busch checks out the new Wizard for Windows computer system which controls KNOM’s audio. About 1,500 radio stations around the U.S. use this reliable system. All of our music, spots, interviews, etc., are recorded as computer files onto massive hard drives. Now that computers are half the cost of broadcast-grade tape recorders, this is not only a powerful system, it is also economical. This particular screen monitors the files which are lined up for playback over the air. The network of six computers and massive hard drives was purchased with help from the Frost and Margaret Snyder Foundation, to whom we are very, very grateful. INSPIRATIONAL SPOT: We are all plants in God’s garden. The plants that are not growing are dying. But God is a miracle gardener. He can even make dying plants bloom! top “SOL” FOOD: Light! And lots of it! Well, by comparison with December, when Nome bottomed out at 3 hours 54 minutes of weak, low-angle sun every day. By the end of January, we’ll be up to almost 7 hours! It really does make a difference. 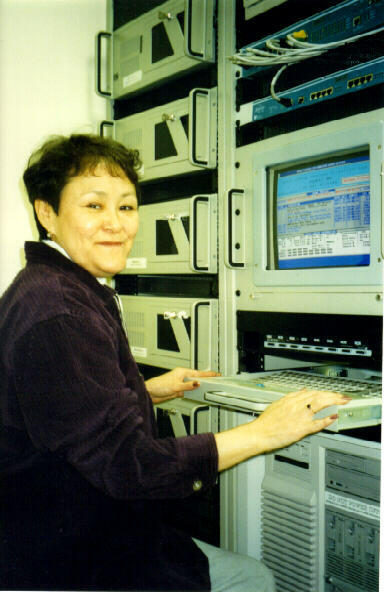 THE 25,000 WATT KNOM SIGNAL beams throughout 100,000 square miles of isolated, roadless western Alaska, serving dozens of remote Eskimo and Athapascan Indian villages. Across the Bering Sea, the station also can be easily heard along 2,000 miles of the Russian coast. KNOM is on the air to bring inspiration, education, news and companionship to far-flung points, many of which rarely see a Catholic priest, religious or lay worker. It’s the oldest Catholic radio station in the United States. Honored by many national and Alaskan awards, KNOM is owned by the Catholic diocese of Fairbanks, and is funded on its own, almost entirely by individual gifts from good people like you. top WAS THAT A FISH AND GAME BIOLOGIST jumping through the snowdrifts at the Nome cemetary? with a roaring chainsaw? It seems that a musk ox had decided to call the graveyard home. Concerned that the usual technique to frighten off game, firing rubber bullets, would damage some of the grave markers, one of the biologists chased the huge animal with the only “portable noisemaker” he could think of. Musk oxen don’t frighten easily. Weeks later, the immense beast is still hanging out in the willow bushes surrounding the cemetary. BIG BOOST: (left) Volunteer Michael Warren demonstrates an antenna booster for Kelly Brabec. Placed next to a radio, the dinner plate-sized booster can really beef up a weak signal. Thanks to one large gift and many, many smaller ones, KNOM has $23,500 in the bank to fund distribution of about 500 of them to our most remote listeners. By the end of December, we had already quietly sent three dozen of the boosters to special friends in distant villages, in order to stir up interest in the units. In February and March, we will send out the rest, as part of a massive contest. It’s a way to stretch our reach. We hope this one effort will increase our listenership by 10% to 15%. 32 YEARS AGO: Nome Static Transmission #3 dated January 1967 reported that “we are studying available maps to locate a piece of ground about five acres or so for our remote site.” 1966-67 was a heavy snow winter, with drifts above the 11-foot rectory roof. top LOTS OF HAM: Congratulations to KNOM volunteer Kevin Glynn, who passed the tests for a Tech-Plus amateur radio license, and is now licensed as KLØQU. Meanwhile, general manager Tom Busch, an Advanced Class ham for 28 years, finally upgraded to the highest level, Extra Class, with the call sign NL7H. The exam includes a 100-character-per-minute Morse Code test, and Tom reports that the sweat was flying off in all directions! INSPIRATIONAL SPOT: Death is not putting out the light. It is turning off the lamp because the dawn has come. top 2,800: By the end of January, that’s how many inspirational spots KNOM will have already broadcast during 1999. We also will have aired an equal number of educational spots! 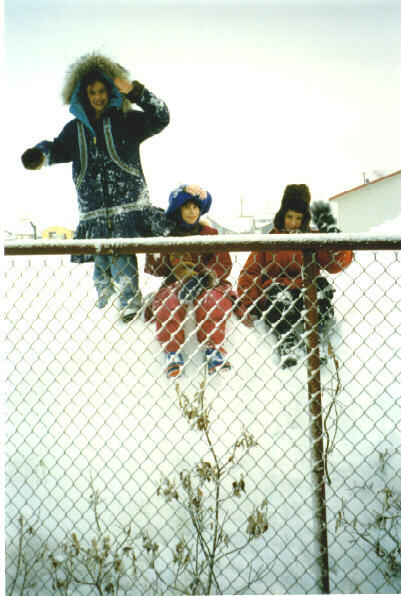 DRIFTING AROUND: (left) The eldest half of Ric and Lynette Schmidt’s clan (from left, Jenna, Tara and Nick), pose on a snowdrift behind a 6-foot fence about a block from the KNOM studio. The snow built up during a two-day blizzard the week before Christmas. Many drifts were twice this high. As often happens in windswept western Alaska, snow drifted five feet high on one side of the fence, though on the other side, the wind raked the frozen ground bare. For children, it was a bonanza. Thanks to an unusually warm flow of air off the North Pacific, December’s snow fell wet and sticky, perfect for snowballs and snowmen. Ordinarily, the snow in Nome is dry and granular, and drifts hard and dense, like cinder blocks. INSPIRATIONAL SPOT: Why do we pray? To adore God, to express our love and loyalty, to thank God for favors, to ask pardon for our sins, to ask for graces and blessings for ourselves and others. How do we pray? With attention, conviction of our dependence on God, with a great desire for God’s graces, with loving trust in God’s goodness, and with perseverance. top MARATHON: December 22nd, general manager Tom Busch hosted a 7-hour call-in program, inviting listeners to call and send holiday greetings over the air, the fourth year we’ve done this. Over the course of the show, we aired wishes from 291 listeners, from tots to elders. It’s impossible to count how many people were mentioned over the air, but we estimate that it was about 8,000. Whew! INSPIRATIONAL SPOT: I know, O God, that wherever I travel, You will be with me. There is nowhere I can go, no situation I can face, which is outside Your Love and Strength. And so I commit myself into Your Care, and keeping on this journey, knowing that at all times I am in Your Hands. “Your style of programming is the BEST I have heard...Your station has also brought peace...I have not been active in the church for several years, but I am trying to change this now.